Out-of-school experiences for high schoolers foster purpose and belonging. 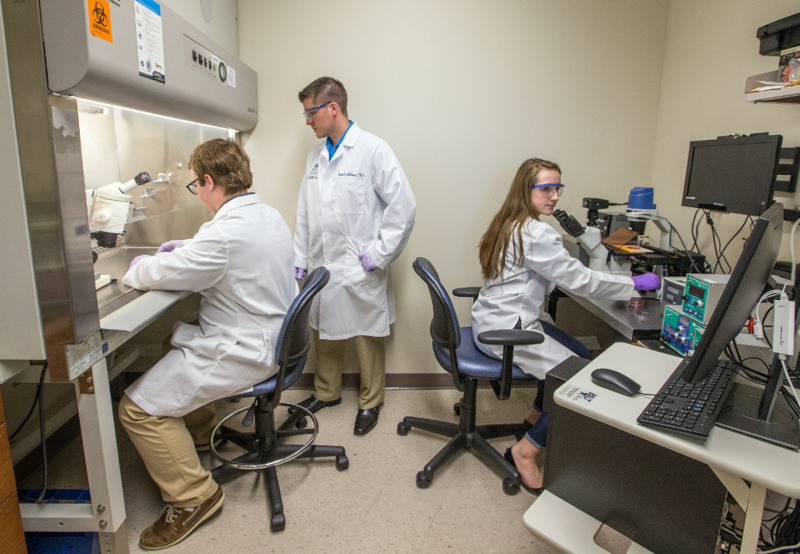 High school students work in a research lab at the Medical College of Wisconsin. Jake skates on the ice with a skill and grace that make ice hockey look easy. As the center on the first line, his specialty is taking a feeding pass from his left wing across center ice, making a left-handed move toward the aggressive defensemen, and with a quick nod to the right, passing the blue line and making a quick wrist shot to score. Jake plays for the junior league of the Milwaukee Admirals. If he keeps working on his game and keeps his grades up, by the time he graduates from high school, he could either play for the minors in Canada or receive a scholarship to skate at a Division 1 university. But is hockey his only option? To Jake, it once seemed so. Jake felt that hockey was about 100 times easier than algebra, where the x’s and y’s and slopes and intercepts had little meaning. Jake and I had many conversations in which he asked, “When am I ever going to use Algebra II?”—the infamous question that has frustrated teachers for decades. English class wasn’t much better. Jake hated writing: There were rules, grammar, and spelling to contend with. Jake always felt that academics were for someone else, someone “smarter.” Hockey was a better option: He felt at home in the rink. In my 25 years of teaching, I’ve come across many students like Jake who disengage from school—not because they aren’t smart or capable, but because traditional, in-school learning lacks relevance for them. For every Jake I’ve encountered, I’ve seen just as many students who excel at playing the game of school—get good grades, go to good colleges—but never develop any real passion for a course of study. They’re students like Mara, who had always been one of the smartest people in her classes. School was easy for Mara, though her peers found her abrupt and lacking in empathy. She could “win” at school, but like Jake she saw little real meaning in what she was learning. The question “When am I going to use this?” can make educators feel like we’ve failed somehow. It implies that none of what we’re doing—the lessons and exercises we carefully crafted—actually matters. Whether we teach Algebra II or U.S. History, we want students to be engaged in the subject matter we care about, that we believe has purpose and value. But I think it’s important to be mindful that relevance in learning is defined by the student, or rather, the student’s interests—not ours. The job of a teacher is not just to teach content, but to help students apply it in meaningful ways to their lives. Five years ago, my colleagues and I realized we had a much larger problem than answering an annoying question. We saw connections in the behaviors we saw from our students and in the national data—the high college dropout rates, low civic participation, and high job turnover percentages. Putting our best ideas together, we set out to develop a high school that would make learning relevant for students, not just in the four years of high school but throughout their lives. Students participate in field experiences at Lake Country Fire and Rescue. We looked to our community for guidance, finding that health sciences professionals were eager to support students with an early interest in that field, especially as they face a potential shortage of skilled workers. Partnering with research labs, hospitals, and our fire station, among others, we developed field experiences for our students—some lasting weeks at a time—to complement our in-school academic learning. Our students now work alongside doctors and nurses in the emergency room. They conduct experiments in science labs. And they develop research projects with a focus on community health and social justice. These real world, career-aligned experiences truly test our students, taking them outside their comfort zones. Over the last several years, we’ve helped students like Jake and students like Mara consider new options and possibilities for their futures. We feel we’re successful both if students find a calling and if they decide they aren’t interested in a particular field of study—the goal is to get them off the fence of ambiguity either way. When Mara did an internship at a university research lab during her junior year, for example, it was first time in her life that she wasn’t the smartest person in the room. She felt out of place, and quickly began to doubt herself. But over time, with support from her father and teachers, she realized that education isn’t just about being smart, it’s about the social and emotional learning that needs to accompany the learning experience, which allows for a person to really be successful. And as a sophomore, Jake did fieldwork with EMTs at our local fire and rescue station. After nearly setting a record completing the obstacle course—while wearing 50 pounds of gear—Jake took off his mask and helmet, grinned, and asked, “Do people actually get paid to do this?” For the first time in his life, he felt there might be an option other than hockey. When asked why he continues volunteering at the station, Jake’s answer is simple: “It’s where I feel like I belong.” While Jake certainly uses his knowledge of biology and anatomy as an EMT, it’s the social and emotional connection—the sense of belonging and possibility— that keeps him engaged. Since he started working as an EMT, Jake’s engagement in math and English has also improved. The self-awareness and sense of belonging that Mara and Jake have found do not usually come from a traditional high school or college experience, yet we tell young people it will: Get good grades, go to college, and find a job afterward. It’s no wonder that so many students drop out, or struggle to find or stick with a job. I speculate as to the causality, but it seems that high school and college would better suit the needs of students if there were an embedded field experience that fostered conversations with like-minded students and professionals. For students to be successful, school needs to have both academic and social and emotional relevance. Students also need experience in work environments outside of school that help them carve their identities and their futures. While it’s not possible for every school to offer fieldwork, they can provide experiences that give students an authentic connection to learning. If a student does not see, or worse, does not feel a sense of relevance, then school becomes a game. That game does not lead to a career.